Several of my colleagues have recently recommended that I take a serious look at the “smart pen” products produced by a company called Livescribe. Essentially they manufacture and sell a pen that not only digitizes what you write (on special paper) but also records the corresponding audio that might be present when the pen was in use. These notes can be stored on a computer so you can refer back to the information at a later time. Obviously there are some easy use cases that come to mind for students, lawyers, or general business professionals who spend 90% of their days in meetings (i.e., me). Given my background in technology I had heard of the company and was familiar with their Pulse device that was released in 2007 but was a bit concerned that the company’s flagship product had not received a refresh in nearly three years. Worry no more. Earlier this month Livescribe released the Echo which is essentially a major performance upgrade from the Pulse and improves the form-factor considerably. In addition they’ve standardized the connectors used by the device so you don’t need to lug a docking station around with you to sync the pen with your computer. That said, I’ve placed my order with Amazon.com and am hoping to have the device in hand later this week. Update (08-Aug): I received my Echo pen on Friday and despite struggling to get either my laptop or desktop PCs – both of which run Windows 7 – I was eventually able to begin using my new device. Regarding the basic functionality (recording and playback of synchronized notes and audio), it essentially works as advertised. I have yet to subject it to a full day of meetings and note taking, so we will see how it fares this week. One item I did notice is that the actual ballpoint pen is a bit “scratchy” and isn’t nearly as smooth as a generic pen of this nature would perform. Additionally the pen’s operating system seemed to hang on occasion and would require me to power it on and off before it would respond to commands. I received my replacement yesterday and I’m having another go at it today. Update (25-Aug): Despite receiving a replacement pen from Amazon.com and upgrading the OS on the pen, it still does not work as advertised. The handwriting recording functionality seems to struggle with my vertical pen strokes and records only about 50% of those marks. I’ve tried holding the pen in several different ways (including several that are quite uncomfortable) and none seem to help address the issue. That said, the audio recording capabilities are quite good but that does not do much to compensate for the other problems. 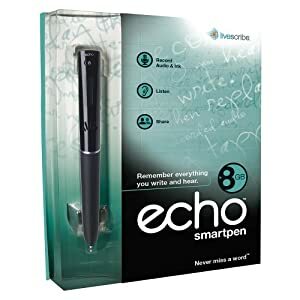 Alas, as of today I have returned my Echo smart pen and am awaiting my refund.